On Saturday the 31st of October, a city centre car parking space was temporarily reclaimed for the people of Galway. What used to be a car parking space was transformed into a mini public park to celebrate Galway’s first ever Park(ing) Day. 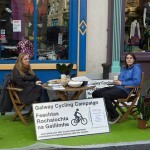 The aim of Park(ing) Day is to convert a single metered parking space into a temporary public park in an area of Galway City that is underserved by public open space. The objective is to creatively explore how our urban public space is allocated and used. Inexpensive kerb-side parking results in increased traffic & less space in the city centre. This hinders the movement of pedestrians, cyclists and motor vehicles, adds to the level of CO2 emissions and prevents the creation of a healthy, vibrant urban human habitat. Park(ing) Day is about re-imagining the possibilities of the metropolitan landscape. Galway’s newest green space was offered (and used) as a space to sit down to have a chat with friends, read the newspaper or simply to watch the world go by. 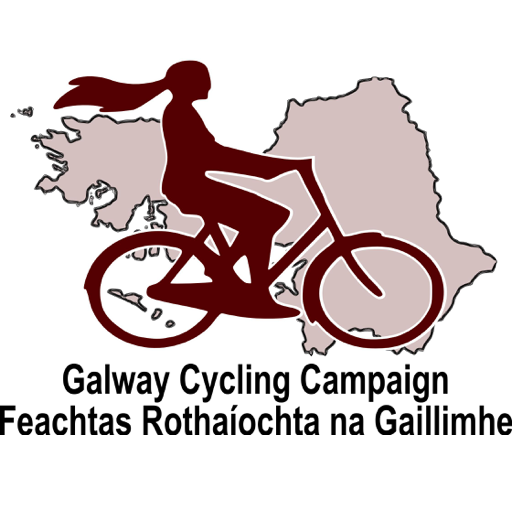 The Galway Cycling Campaign also provided muffins and Justyna’s famous “bicycle shaped” cookies! The parking meter was always running and contributions were taken from passers by to feed the meter and make sure the new “Park” was paying its way! This is a great idea. People sometimes complain about the difficulty of finding parking in Galway, especially in the centre, but a lot of cities have been removing central parking capacity for years now. What Galway is sorely lacking is green space. There are a few small parks and patches here and there, and some lucky trees, but compared to more forward-thinking municipalities it’s a lot more grey here than green, and that’s a real shame. I’m sure your temporary mini-park made passers-by think about the importance of re-imagining civic space. Hopefully next time I’ll be able to visit. 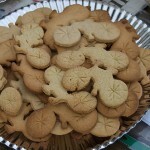 Can’t believe I missed those biscuits!